Day 1: From Fortaleza to Munda�: off-road through the beaches. By the morning we leave Fortaleza heading west, to the famous beach of Cumbuco. 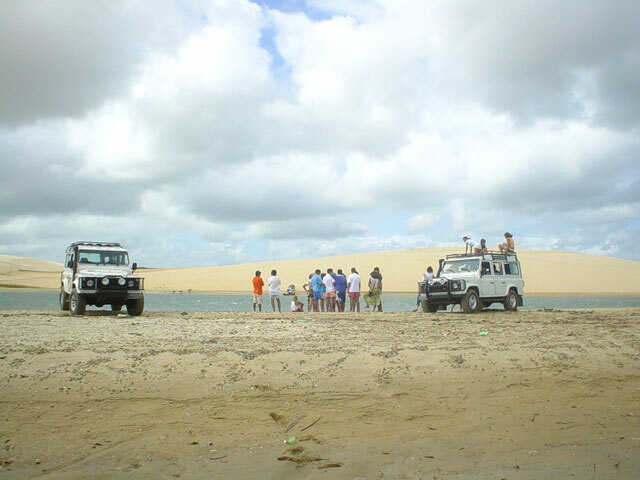 Following sand tracks through palm trees and dunes, we will visit the lagoons (Banana and Cauipe), then by the beach we get to the new port of Ceara, the third in exports from Brasil, the port of Pecem. Then Taiba and Paracuru. Here we must get a track over the inland to get across the Curu river and then, Lagoinha. One of the most famous portraits of the state. Here we can stop for some caipirinhas, shrimps....and enjoy the sun. After that stop, we continue through the village of Guajiru, Flexeiras and Embuaca, almost untouched paradises with the natives and local sightseeings. As the night comes, we go to our pousada right by the sea where we can relax and get a very nice sleep with the sea soundtrack. Day 2: From Mundau to Jericoacoara. 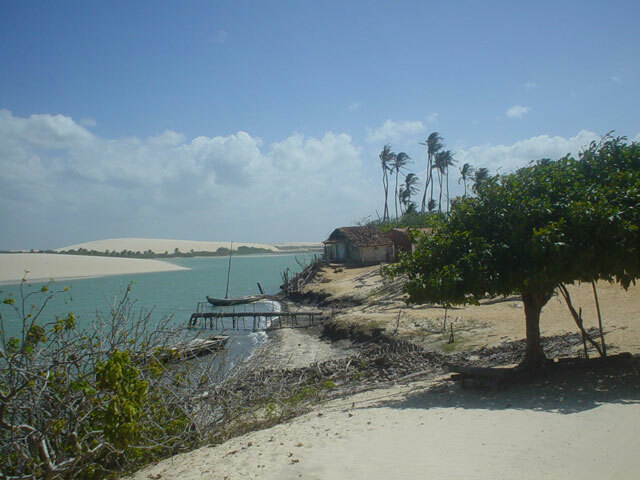 By the morning we cross the river Mundau on a tipical boat to get to Baleia and from there we get to deserted and untouched places, like Sabiaguaba and Icarai de Amontada, an oasis filled up of coconut trees where we can stop for lunch depending on the tide. From there on we continue on tracks through isolated villages and some kilometers on road untill we get to Praia do Prea, where we enter the National Park of Jericoacoara by the afternoon. 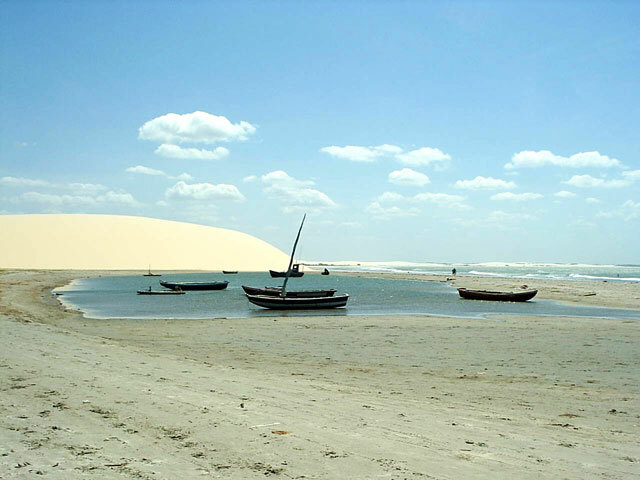 In the village of Jericoacoara we walk through it�s sand strees with it�s fantastic and unique atmosphere that makes of "Jeri" one of the most beautiful beaches in the world. Day reserved to see and feel how Jeri is. We suggest a trekking to the famous post-card rock with a hole where you can see the sunset at its hole on july/august. Also a horse ride through the dunes (cars are not allowed there). On this day we visit the lagoons of cristal water. Blue lagoon and Paradise Lagoon. Return to Jeri to see the amazing sunset on the top of the dune. Leaving Jeri in the morning, we�ll visit some spectacular sightseeings through kilometers of desert beaches, mangroves, mobile and fixed dunes and a lagoon that makes of this an unforgettable destination !! We�ll visit the ruins of the old Tatajuba that was buried by the sand. Also the new Tatajuba, where people moved to. This place is full of misteries and legends that we�ll get to know as we get in touch with the local natives. Transfer on normal road. Trip Time: 4 and a half hours aproximately.